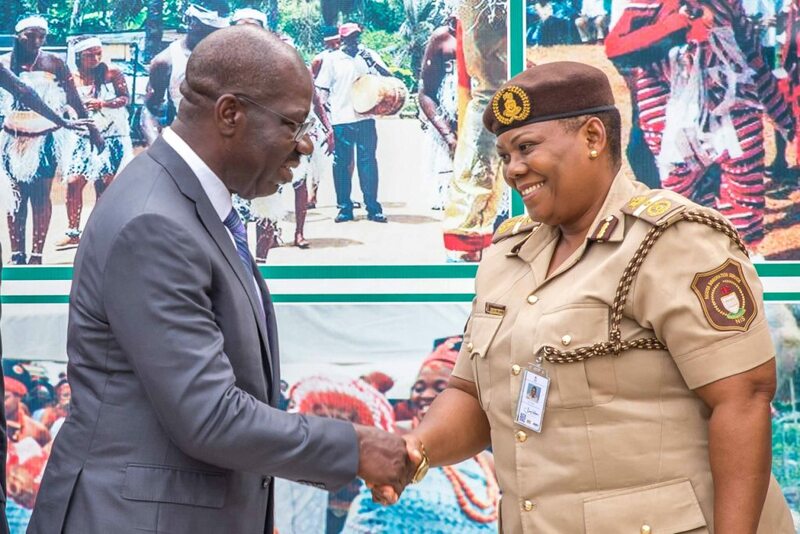 To provide support for returnees who are indigenes of Edo State and to facilitate their rehabilitation, Governor Godwin Obaseki has urged the Nigerian Immigration Service (NIS) to collaborate with the Edo State Government. The governor made this request when he received the Zonal Coordinator of NIS Zone G, Mrs Chizoba Dibi on a courtesy visit at the Edo State Government House in Benin on Monday. He explained that his administration was working tirelessly to curb youth migration and palliate anticipated discomfort that returnees from Europe, who were indigenes of the state, may experience. On controlling emigration, Governor Obaseki said: “We are dealing with the root causes of migration and are creating opportunities for our youths to be gain fully employed. We have added the teaching of vocational and technical education to our schools’ curricula to equip our youths with the needed skills for self-reliance”. He also sought the collaboration of the service to track increasing security threats brought about by foreigners posing as Fulani herdsmen to wreak havoc in some communities in the state. On the challenges the state was facing in rehabilitating the foreigners, Governor Obaseki noted that the state did not have the statistics of those returnees and that was a challenge in the process of incorporating them back to the society. “I am not comfortable with the way the issue of returnees is being handled. The state has no record or statistics of those that have come back; we don’t have the benefits of resettling them we feel this should be corrected” he said. He therefore encouraged the service to furnish his administration with the statistics of returnees so that better livelihood would be provided for them. On the purpose of the visit, Dibi said it was to intimate the governor on the recent development of the service, adding that it would soon embark on electronic registration of all foreigners in the country in order to have a demographic record of them. Already, she explained, the zone had issued 20,896 e-passports to citizens in the country between January and February this year through its passport offices. In addition, Dibi also said that the service was doing a lot in tackling human trafficking and other related immigration issues in the states covered. She thereafter solicited for the state’s government support in the provision of logistics to address the incessant cases of security challenges posed by some foreigners in the state.